Rainbow Trays products are produced in clean room conditions and manufactured using recycled material. The recycled content is minimum 80%. 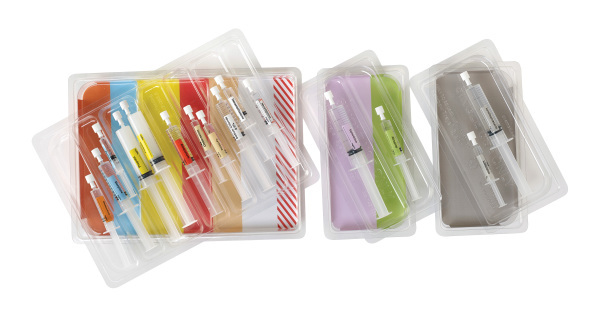 Rainbow Trays™ are made from three different types of Polyethylene Terephthalate. Recycled Polyethylene Terephthalate - RPET. The base trays are made from PETG and PET while the disposable insert trays are made from RPET and PET. Rainbow Tray™ base trays are made using PETG which has excellent chemical resistance, is sterile, bacteriostatic and ideal for medical applications. PET or PETE (polyethylene terephthalate) is a plastic resin and a form of polyester. Polyethylene terephthalate is a polymer created by the combination of two monomers: modified ethylene glycol and purified terephthalic acid. PET is routinely used globally in food and drinks packaging industry and is the most sustainable plastic available for use where bacteriostatic properties are required. PET can be identified by looking at the bottom or backs of containers for the #01 resin identification code – a symbol recognized by the #01 in the middle surrounded by the “chasing arrows”. Rainbow Trays™ are 100% RECYCLABLE. Where facilities exist, Rainbow Trays™ can be recycled in regular municipal recycling facilities. The cost of this is up to 10 times less than the cost of the removal of clinical waste. Recycled polyethylene terephthalate is known as RPET, and is the most widely recycled plastic in the world. RPET is used in the production of Rainbow Trays and is safely sandwiched between outer layers of virgin PET. The minimum proportion of RPET in Rainbow Trays is 80%. Rainbow Trays™ are made from recycled PET and are suitable for 100% recycling. This makes the Rainbow Trays™ the most environmentally friendly option to use compared to pulp or other composite materials that cannot be recycled and reused. Global confidence in the hygienic and chemical safety of PET stems from the fact that the PET polymer is very stable and inert. Like glass, it is strong, resistant to attack by micro-organisms, does not react with foods, and without the requisite chemical additives, will not biologically degrade. PET is approved for food use by both the US Food and Drug Administration and its European counterpart, the European Food Safety Authority. PET is non-toxic and safe for the packaging and storage of food and beverage products. it is biologically inert if ingested, safe during handling and not a hazard if inhaled. PET is also bacteriostatic which means it will not harbour bacterial growth on its surface. In the mid-1940’s chemists at DuPont, searching for materials for use in textile fibres, synthesised polyethylene terephthalate. PET film was created in the 1950’s by stretching a thin extruded sheet of PET which is found today in photographic, video, X-ray and packaging films. Then in the 70’s, blow-stretch moulding of PET in shatterproof bottles was developed and in 1977 the first PET bottle was recycled. 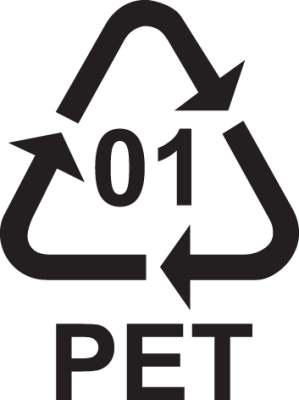 Recycling of PET first started in 1975 and today PET is the most widely recycled plastic in the world. All parts of it can be recycled and turned into a multitude of new uses - from new PET film and products to fleece textiles, shoes, fibres, carpeting, automotive parts and luggage - or even sports kits, such as those designed by Nike for the FIFA World Cup in Brazil earlier this year. The use of recycled PET in place of virgin material typically results in reduced energy consumption, lower cost, and reduced environmental impact.